Are you ready for a little TLC? Well, have I got news for you! I am so excited to announce that I have the pleasure of joining a wonderful group of exclusive select blogger friends to bring you this amazing Fancy Frills Giveaway. 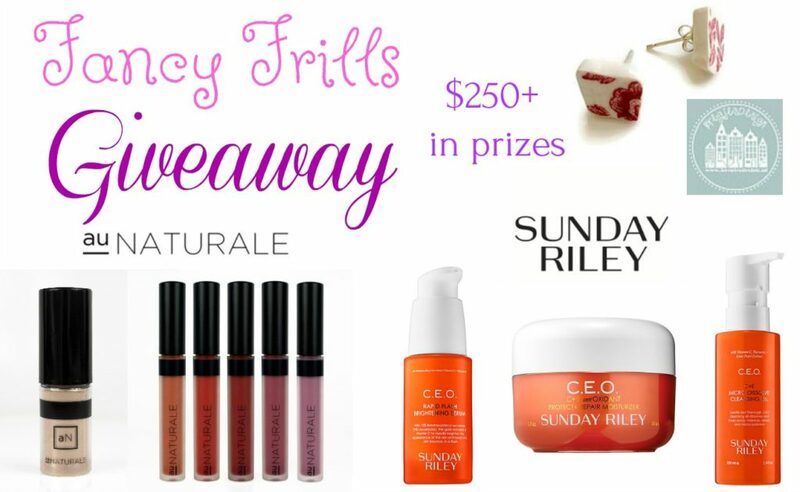 Hosting this spectacular giveaway, MamatheFox has put together an amazing giveaway, the Fancy Frills Giveaway featuring some really awesome beauty products valued at over $250 retail. This exciting giveaway runs from August 25 - September 8, 2017 and is open to eligible US residents. Enter for your chance to win- (1) C.E.O Moisturizer, (1) C.E.O. Cleaning Oil, and (1) C.E.O. 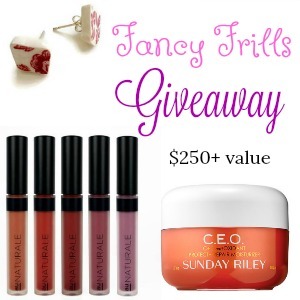 Brightening Serum from Sunday Riley, winners choice of (1) Pair of Stud Earrings from Bregje's Design, and (1) Pure Highlighter Powder, and (1) Lip Stain from Au Naturale Cosmetics. MamatheFox and all participating hosts are not to be held responsible for sponsors who fail to fulfill their prize obligation.